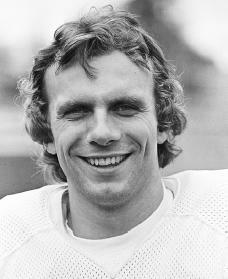 Joe Montana has earned a reputation as one of the top quarterbacks ever to play professional football, first rising to fame in the 1980s. Joseph C. Montana Jr. was born on June 11, 1956, in New Eagle, Pennsylvania. His father, Joe Montana Sr., was a manager with a finance company, and his mother, Theresa, was a secretary with the same company. They lived in Monongahela, Pennsylvania. Joe loved playing sports. Every night as a young boy he would wait for his father to come home so that they could play catch with a football or a baseball, and practice throwing the balls through tire swings for accuracy. The Montanas also had a basketball hoop in their driveway, where Joe would often be seen playing a game with friends or practicing on his skills. He just loved to play sports. served as vice president of his class during his senior year. He also was the starting quarterback for the football team from the middle of his junior year on. His abilities attracted the attention of major colleges around the country. In 1974 he was named in Parade Magazine as an All-American quarterback. Joe Montana nearly accepted a basketball scholarship to North Carolina State University. But western Pennsylvania is known for its love of football, and such a tradition finally swayed Ringgold High's star quarterback to attend the University of Notre Dame in Indiana on a football scholarship. It was a school known for excellence in both sports and academics. Joe knew that he would get a good education as well as a great chance to play football. As a homesick freshman, however, Montana may have had doubts about his decision-making skills when he realized that he was barely holding on as the Fighting Irish's seventh-string quarterback. Early in his career Montana made the most of his occasional appearances in football games. As a sophomore he twice led Notre Dame back from behind in the fourth-quarter for unlikely wins, including a game against Air Force in which he came off the bench with just twelve minutes remaining to erase the Falcons' twenty-point lead. He inspired two more rallies as a junior and two more still as a senior. He soon was known as Notre Dame's "Comeback Kid." Still, Montana did not become Notre Dame's first-string quarterback until his senior year; and in his last game he again performed a comeback in the fourth quarter during an ice storm to defeat Houston in the last seven minutes. Yet, despite his amazing football instincts and his calmness under pressure, Montana was not a highly promoted prospect when he entered the 1979 National Football League (NFL) draft. Eighty-one players were selected before the San Francisco 49ers drafted Montana late in the third round. New 49ers coach Bill Walsh ignored the negative scouting reports on his rookie quarterback, and envisioned Montana as the leader of his complex ball-control passing attack. Walsh's "system" depended on a quick quarterback with an accurate arm who could adjust quickly to the other team's defensive strategies. By the 1981 season Montana and the 49ers had become a sophisticated and practically unstoppable offensive machine, but they met an old enemy in the National Football Conference championship game, the Dallas Cowboys. Montana again led a team from behind to win this game in the last seconds. San Francisco went on to win Super Bowl XVI over the Cincinnati Bengals, 26-21. Montana was named the game's Most Valuable Player (MVP). It was to become a familiar scenario during the decade. The 49ers would win four titles by 1990, including consecutive Super Bowls in 1989 and 1990, and Montana was awarded the MVP trophy in three of those championship games. Not only did Montana complete almost 70 percent of his passes in those four Super Bowl victories, but he also never threw an interception in 122 attempts. He drove the 49ers 92 yards in the last few moments of Super Bowl XXIII to beat Cincinnati again, 20-16. In Super Bowl XXIV Montana came back with an even more impressive performance, completing five touchdown passes in a 55-10 victory over the Denver Broncos. When he retired in 1995, Montana held NFL playoff records for completions, yards, and touchdowns, as well as single-season (1989) and career records for passing efficiency. Joe Montana was inducted into the Pro Football Hall of Fame on July 29, 2000. He is now involved in sports of a different kind. He raises horses with his family in Northern California. He and his children compete as riders of the horses they raise. But no matter where he goes, Joe Montana will always be remembered as one of professional football's greatest players. Appleman, Marc. Joe Montana. Boston: Little, Brown, 1991. Montana, Joe, and Richard Weiner. Joe Montana's Art and Magic of Quarterbacking. New York: Henry Holt, 1997. Montana, Joe. Montana. Atlanta: Turner Publishing, 1995. Hi, Joe Montana is my favorite QB ever! You inspire me and give me hopes and dreams. thank you for everything! The old saying..."You never get a 2nd chance to create a first impression." We can ALL learn from this. Thought of this yesterday, after meeting with Arnold Palmer. He told my son, Ryan, that 20 yrs ago his secretary estimated he'd signed 3 M autographs, then! To the point, Ryan once asked Joe for his autograph as he played the 8th hole at Pebble Beach during the Nat'l Pro-Am. (Joe was playing with Brown's QB Brian Sipe). Sadly, Joe ignored Ryan and the boy's request. Ryan brought this up yesterday after meeting with The King. It's unfortunate. I'm sure Joe's a gentleman, but..."Arnold Palmer" he's not. Joe could use a "mulligan".